A family scene from the Neighborhood chapter of "Where We Live." Easy access to jobs, stores, schools and social activities. Parks to enjoy and markets that offer healthy food, helping people make smart choices. Access to culture that keeps local life interesting. Transit options that make getting around safe and easy. Opportunities to learn, work and contribute to society. An engaged population and responsive government. These elements have appeal across generations and provide the blueprint for sustainable, vibrant communities. Staying in their homes and neighborhoods as they age — connected to friends, family, activities and services— helps older residents thrive. And, more and more, people of all ages want to live in neighborhoods that are easy to navigate on foot or by transit, with nearby shops and parks as well as cultural, educational and employment opportunities. After decades of sprawl — with housing situated far from com­mercial and cultural corridors — mayors nationwide are refashioning our towns and cities for young and old. 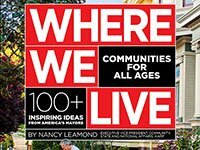 This chapter offers examples of how mayors are putting all the principles of livable communities into action, transforming com­munities and revitalizing neigh­borhoods in ways that benefit residents of all ages. Going back to basics lays an important foun­dation: In some communities, years of economic stress have taken a toll that requires a back-to-basics approach—improving public safety and the delivery of government services, or tackling the blight of vacant properties — to lay a foundation for the future. Walkable, thriving hubs give commu­nities a sense of place: From down­town urban areas to small town main streets, walkable hubs anchored by amenities ranging from arts venues and shopping districts to public parks and commu­nity centers help define a neighbor-hood's identity. Figuring out the financing is half the battle: Some of the projects are large-scale public initia­tives that marshal local, state and fed­eral funding. Others use tax incentives to encourage private developers and businesses to take the lead. Community engagement makes a difference: Under­lying successful initiatives is a com­mitment to engag­ing local residents. Soliciting input and translating resi­dents'priorities into action gives people a stake in neighbor­hood improvements and trust that their local government is on the right path. Dallas Mayor Mike Rawlings (as seen in "Where We Live") painting as part of his GrowSouth Initiative. When Mike Rawlings first ran for mayor in 2011, he made revitalization of the sprawling city's southern tier a central part of his campaign platform. This businessman-turned-mayor saw tremendous untapped potential in the area that comprises roughly half of Dallas's land area and is home to 45 percent of the city's population but contributes only 15 percent of its tax base. Soon after he was elected, he launched GrowSouth, a broad-based initiative aimed at maximizing the area's economic development potential with significant investment and infra­structure improvements. But a strong foundation is generally necessary before a growth strategy can take root. While progress has been made, troubling trends persist: poverty, a declining number of middle-income families and a lack of affordable housing and jobs. Attacking these problems and strengthening neighborhoods is essential for the broader effort to succeed. To turn the tide in three struggling commu­nities, Rawlings added new strategies to the GrowSouth plan. Neighborhood planning boards in each of the three designated areas are setting goals and priorities based on their community's unique character, opportunities and challenges. To identify obstacles and cut through red tape, each community gets its own "general manager," with a direct line to City Hall and access to the city's nonprofit and corporate leaders. Rawlings calls this approach the GrowSouth Collective Impact Model. By building from the ground up — empowering communities to demand more from their government and lever­aging resources of neighborhood organizations, government and nonprofits — he hopes these communities will be able to grow and improve. Well before construction of a new convention center begins downtown, Mayor Kathy Sheehan began work to make sure that city residents bene­fit from the new facility and the potential it brings to downtown Albany. Sheehan views the conven­tion center as much more than a single building; she sees it as an opportunity to redefine Albany as a destination, attracting new jobs and improving the economy. Stephanie Rawlings-Blake initiated Baltimore's Vacants to Value project to tackle the urban blight plaguing her city. The 2010 U.S. Census identified more than 16,000 vacant prop­erties in Baltimore — a situation that contributed to crime and an overall sense of neglect in the city's neighborhoods. Now the city is demolishing vacant houses, turning the properties into green spaces, new housing developments and commer­cial investment opportunities. In early 2016, five years after the initial investment, Rawlings-Blake and Maryland Governor Larry Hogan announced new fund­ing to continue the program. By stabilizing these distressed communities, Rawlings-Blake aims to make it easier for older residents to age in place while expanding opportunities for all. An active fundraiser for efforts to build the International African American Museum (seen in an artist's rendering), Riley says: "Historians call this the Ellis Island for African-Americans, so we’ve acquired land in the old wharf area where so many arrived." Getting the community on board for a complete redesign of Concord's Main Street is one of Mayor Jim Bouley's signature accomplishments. The ambitious project makes downtown more pedestrian-friendly by reducing the road from four lanes to two, widening sidewalks and installing cobblestone medians and brick crosswalks. The addition of trees, planters, benches, streetlights and signage enhances the overall aesthetics of the area, so spending time downtown — whether shopping, dining or strolling — is more appealing. Bouley was instrumental in building community support for the project through a series of public meetings and the appointment of a 17-member advisory commit­tee. The city completed a five-block stretch of the new Main Street in November 2015, with the next phase of construction started in spring 2016. Going back to basics is job #1 for Mayor Mike Duggan. He is taking up the challenge of revitalizing Detroit's neighborhoods by improving city services, tackling the blight of vacant homes and cultivating entrepreneurship in the city's commercial corridors. In his first year in office, he oversaw the installation of more than 18,000 streetlights and reduced emergency response times to the lowest level in five years, helping residents feel more secure. An aggressive out-reach effort to homeowners improved neglected homes, while abandoned properties were sold or torn down. And a new wave of entrepreneurs is creating a virtuous cycle. As they open businesses in commercial areas, they join a growing community of committed residents of all ages working together with the support of city government to bring Detroit back. Carolyn Goodman wants Las Vegas to be a great place to live — not just a great place to visit. Witness her plan to create an urban village in the city's downtown area. The Symphony Park project, a 61-acre development in the heart of downtown Las Vegas, features walkable blocks with street-level retail divided into four districts: the Civic District, home to parks and a perform­ing arts center; the Specialty District, for hotels and retail; the Residential District, with a variety of single and multifamily homes; and the Med­ical District, which includes an outpost of the renowned Cleveland Clinic. Providing opportu­nities to live, work, shop and play across gener­ations is designed to make Las Vegas a thriving community that people want to call home. Championed by Mayor Tomás Regalado, the MiMo Biscayne Plan is transforming a stretch of Biscayne Boulevard into a walkable urban village. Once the gateway to Miami and a hub of activity, the area suffered following the construction of Interstate 95. Today, the boulevard is coming back to life, but upgrades are needed to make it a safe and attractive thoroughfare for local residents and visitors. The MiMo Biscayne Plan is to create a Main Street spirit that uses a block-by-block best-practice approach. Landscaped medians, on-street parking blocks, wider right-of-ways, more pedestrian crosswalks and street-scape furnishings are designed to make Biscayne Boulevard a vibrant gathering place for residents and visitors of all ages. Fulfilling a decades-long vision, Mayor Frank Ortis is spearheading the creation of a new downtown center in Pembroke Pines. The project includes a new city hall building, a state-of-the-art performance and conference center and an art gallery nicknamed "The Frank" in honor of Ortis. Residents will find community workshops, lectures, seminars and classes that make culture accessible, approachable and affordable. In partnership with private real estate developers, the revitalized city center is envisioned as an urban-style cultural and lifestyle hub for the community that will spur new economic growth through the inclusion of retail, restaurants and hotels. Hard hit by the Great Recession, Providence neighborhoods are on their way back with help from Mayor Jorge Elorza. Just months after he was sworn in, Elorza announced the Neighbor­hood Revitalization Act, a new tax-incentive pro­gram designed to foster business development in underserved areas. Projects in 19 neighborhoods are eligible under the program, which includes incentives for community involvement and local hiring. The program aims to benefit citizens of all ages, with older residents able to access nearby services while younger residents find new career opportunities close to home. Santa Ana is a much safer place today than it was when Miguel Pulido first ran for mayor in 1994. Back then, a resident showed candidate Pulido a brick wall he had built to protect his family from neighborhood violence. Today, crime is down 64 percent, thanks to Pulido's initiatives including recruiting and retaining highly skilled police officers, focusing on community policing and using new technologies to detect and deter crime. The new feeling of safety in the community ben­efits residents of all ages. Pulido is now making cross-generational programs an important part of his public safety agenda, urging expansion of after-school programs and improving city parks and recreation programs. Strong neighborhoods built by strong community leaders are the key to great cities, according to Mayor Bob Buckhorn. To cultivate a network of these leaders, he launched Tampa's Neighbor­hood University, an innovative, 12-week program that gives local residents an upclose look at city government and how they can play a role in the progress made by their neighborhood—and the city. The program, which reaches across the entire community and involves citizens of all ages, has graduated more than 150 leaders, building relationships and knowledge that will help move Tampa forward on a range of prior­ities. While leadership programs are common across the country, Buckhorn's unique neighbor­hood-centric approach is designed to help create more focused engagements with residents. Mayor Christopher Cabaldon, as he says, "put his mortgage where his mouth is" when he bought a row house in the Bridge District, a redeveloped industrial area in downtown Sacramento. His promise to move into the new development was a challenge to engage developers in his vision for transforming the urban center into a walkable community. When complete, the Bridge District will house 10,000 residents who will be able to walk or take a streetcar to nearby offices, shops and restaurants. Through his own example and a focus on a walkable downtown with transit and amenities, Cabaldon is building a community where people of all ages can thrive and connect with one another. July 2013: Opening day of Grandparents Park. Proving that you're never too old or young to play, Mayor Carl Brewer partnered with AARP Kansas to create a Grandparents Park in his city's Tri-S neighborhood. With a large number of the neigh-borhood's older residents taking care of young grandchildren during the day, the area needed a safe, fun outdoor play and recreation space within easy walking distance. The park project transformed two city-owned empty lots with playground equipment for the kids, paved walk­ing trails and an exercise station geared toward people aged 50 and older. Now local residents can come to the park to walk their dogs, play with their children and grandchildren, exercise and enjoy the outdoors. Download the collection or select from the 11 individual fact sheets. The AARP Livability Fact Sheets series and the AARP HomeFit Guide are first-place winners in the Clearmark Awards and the Imagining Livability Design Collection received Platinum-level honors from the 2015 MarCom Awards.